All items are hand signed by the artist unless specifically noted otherwise. All items are properly matted and unframed unless otherwise noted. All defects, minor and major, are noted. Please See our "Conditions of Sale" page for information on shipping, guarantees, etc. You can jump to artist's last name by using the alphabet, below. Also, you can search for a given name, item (e.g. "elephant"), location, etc. by using the "Find" function on your web browser. 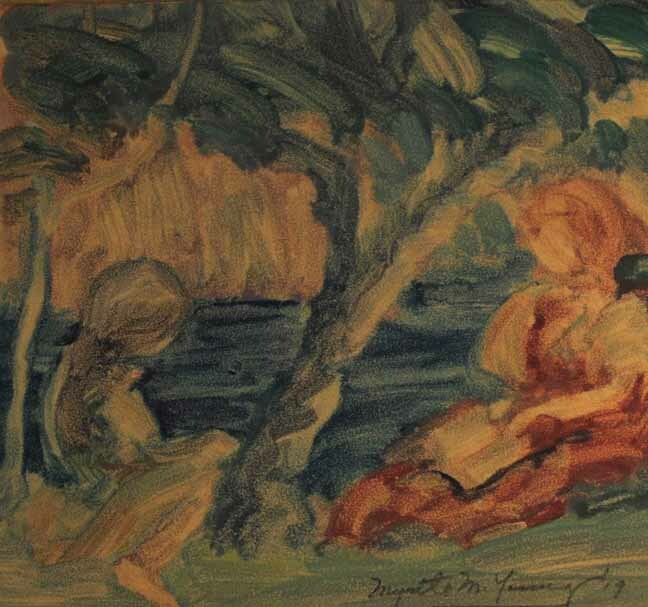 PC users: Control + F and Mac users: Command + F.
[2 FIGURES READING BY A LAKE], monotype in colors, 1919, 6 3/8 x 6 7/8.” Signed in pencil. $750.Signed in pencil in the image (and dated) “Myrtle M. Young.” With a label from Oakland Museum verso. She shared a studio in San Francisco and exhibited with her artist husband Clark Hobart, who was himself known for his monotypes. Nicely framed. “DON JUAN,” pen & ink with white, 1932,9 5/8 x 6 3/8." Unsigned. $450. An Illustration for Kenneth How’s 1932 book The Other Don Juan. Savage was an American illustrator best known for his illustrations in Edith Hamilton’s Mythology and WWII recruiting posters. Unsigned; noted in pencil in margins: "Harbor Press" and "opp. p. 44" and "#2" and "DON JUAN" and "6508-5-3." 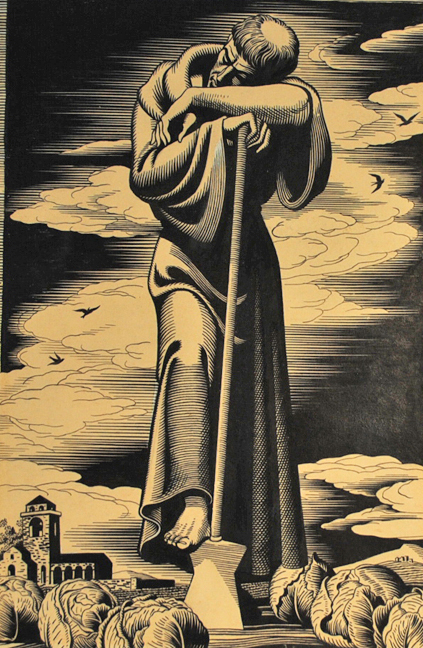 A copy of article discussing this image and Rockwell Kent's drawing of the same subject in the December 1932 edition of The Bookman magazine accompanies the drawing. (This work was erroneously sold as a work of Rockwell Kent at Swann Galleries in 2004). 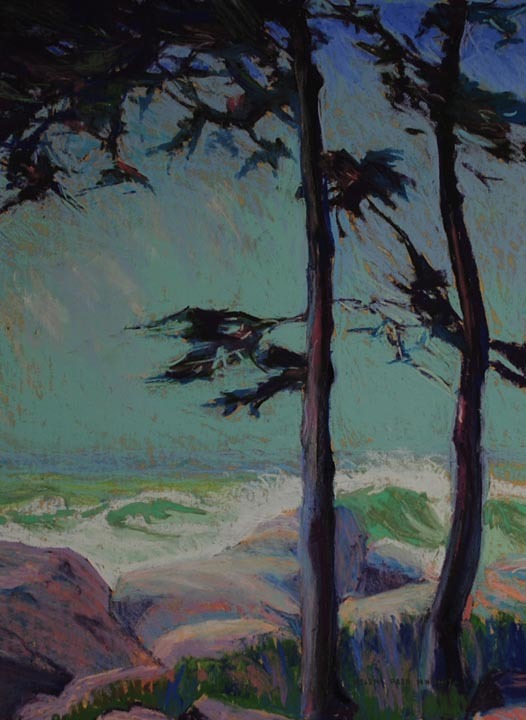 [OCEAN SCENE WITH ROCKS AND TREES*], pastel, c. 1920, 15 1/4 x 11 1/4.” Signed. $995. *Most probably Nantucket where the artist had a home. Whitney studied painting at the Boston Museum Fine Arts School with Frank Benson, Edmund Tarbell, Fred Wagner and Philip Hale. This shows a strong similarity to works of Margaret Patterson--it seems quite possible they may have known each other.